These days, it’s not surprising to find tattoos on people. They used to be associated with deviant behavior but are now completely acceptable and are considered more of an art form. 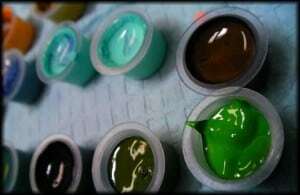 But have you ever wondered what tattoo inks are made of and are they safe? Tattoo inks are substance that are injected underneath the skin with the use of a piercing tool like a tattoo gun, a needle, or anything sharp that can puncture the skin without damaging its surface. Technically, tattoo ink isn’t actually real ink, because if you where to use regular ink, it will easily fade. Instead, pigments from metal, salts, and even plastics are used. These pigments get embedded into the skin and takes years before they fade. The pigments alone are in powder form and have to be mixed with a carrier solution. Commonly used carrier solutions are alcohols, propylene glycol and glycerine. The purpose of carrier solutions is to keep the pigment evenly mixed, to disinfect and provide for ease of application. It is common practice for tattoo artist to make their own of ink. Nowadays, most tattoo inks are sold pre-made so as to standardize colours. Red: Red is made from cadmium red, napthol, cinnabar and iron oxide. Red pigments have higher risk of causing an allergic reaction. Blue: Pigments to produce blue comes from Cu-phtalocyanin, azure blue or cobalt blue. Yellow: Yellow comes from cadmium yellow, ochres, curcuma yellow, chrome yellow disazodiarylide. Yellow also have a high risk of an allergic reaction since a an artist need a lot of this pigment to achieve a bright colour. Green: Chromium oxide, malachite, ferrocyanides, lead chromate monoazo pigment Cu/Al phthalocyanine and Cu phthalocyanine. Violet: Manganese Violet, various aluminum salts, quinacridone and dioxazine. Black: Natural black pigments can be made from powdered jet, wustite, bone black, soot or magnetite crystals. Carbon, iron oxide or log wood are also used to produce black. White: White pigments are made from barium sulfate, white lead, zinc oxide and titanium oxide. Generally, tattoo inks are safe and most are FDA approved for use in food, cosmetic and medical devices.